Figure 1. 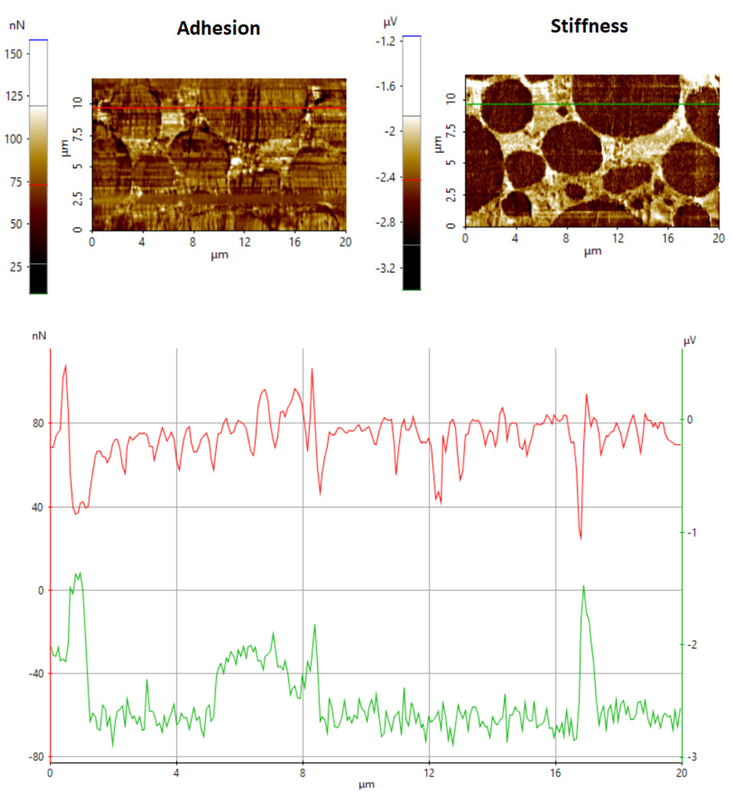 Topography (top-left) resistance (top-right) and conductance (middle-left) images acquired from an LIB electrode sample. Line profile (middle-right): Topography line profile (red line, y-axis on left), resistance line profile (green, y-axis on right), and conductance line profile (blue line, y-axis on right). 3D-overlay image of topography and conductance (bottom). Lithium ion batteries (LIBs) are key components of modern electronics and are regularly utilized as their primary power source [1-3]. LIBs have become ubiquitous in a variety of applications ranging from portable devices to electric vehicles because of their high energy density, flexible and lightweight design, lower self-discharge, low cost and longer lifespan compared to other battery technologies [4,11]. Despite these advantages, the reliability and performance of LIBs still need to be improved to meet the requirements of applications such as large-scale energy storage and hybrid electric vehicles (HEV) [2,5,11]. Extensive research has focused on the development of four cell materials in particular to achieve better performance: positive and negative electrode active materials (AM) as well as separators and electrolytes . 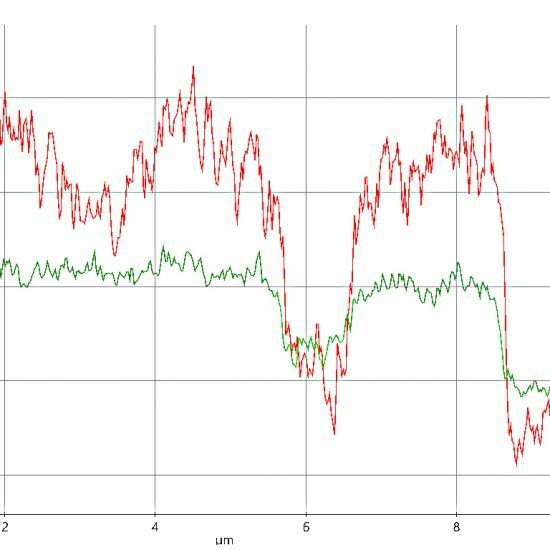 Understanding the electrical and mechanical properties of electrode materials plays a major role in the performance improvement of LIBs. It has been shown that improved adhesions between electrode particles, and between electrode films and current collectors lead to better retention of discharge capacity during cycling, especially when electrode materials exhibit faster and/or larger volume expansion . Moreover, enhanced electronic conductivities and ionic diffusivities in electrodes also lead to LIB capacity improvements . As devices become more compact, optimizing electrical and mechanical properties on a nanometer scale gets more relevant and leads to improved interfaces. There are several methods that can measure these local properties; the more common methods include impedance spectroscopy and nanoindentation [3,7,8]. However, even when using both of these methods, one cannot get the full local information about the above-mentioned properties. Impedance spectroscopy needs an exact model and can only distinguish between interfaces and therefore does not have local information for each interface. Nanoindentation, is destructive and does not provide any electrical information. One of the more effective tools used to overcome the problems encountered in electrical property measurement is Scanning Spreading Resistance Microscopy (SSRM). This technique simultaneously measures both electrical properties and topography. However, SSRM has some disadvantages such as rapid wearing of the tip, degradation of image resolution and low signal-to-noise ratio. These disadvantages stem from the high frictional force arising from continuous tip-sample contact during scanning. 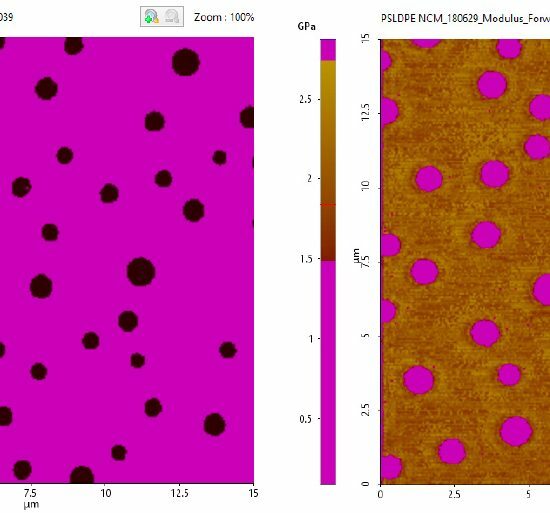 Recently, a new operational atomic force microscopy mode developed by Park Systems called PinPoint™  AFM can be coupled with SSRM to offer scientists and engineers an innovative solution to avoid the troublesome frictional forces during a scan. This method operates in an approach-retract manner, ensuring a frictionless operation which eliminates the lateral force from continuous tip-sample contact. In addition, the integration of these methods with AFM enables it to acquire topography as well as electrical/mechanical property data simultaneously without changing the sample or tip. 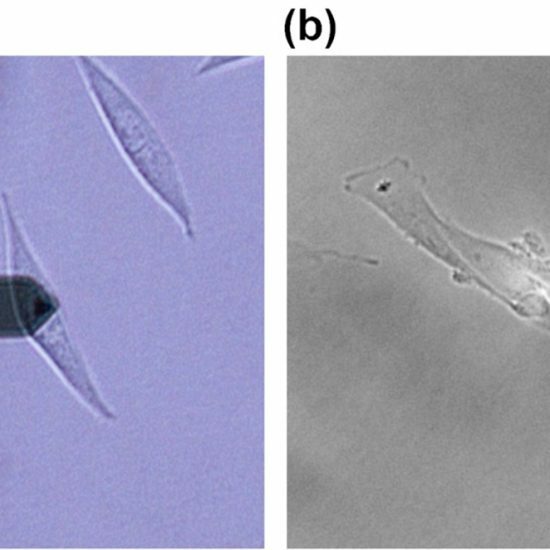 Here we demonstrate that PinPoint™ SSRM AFM effectively measures both electrical and mechanical properties of LIBs electrode surfaces at a much higher quality using a Park NX-Hivac atomic force microscopy system. 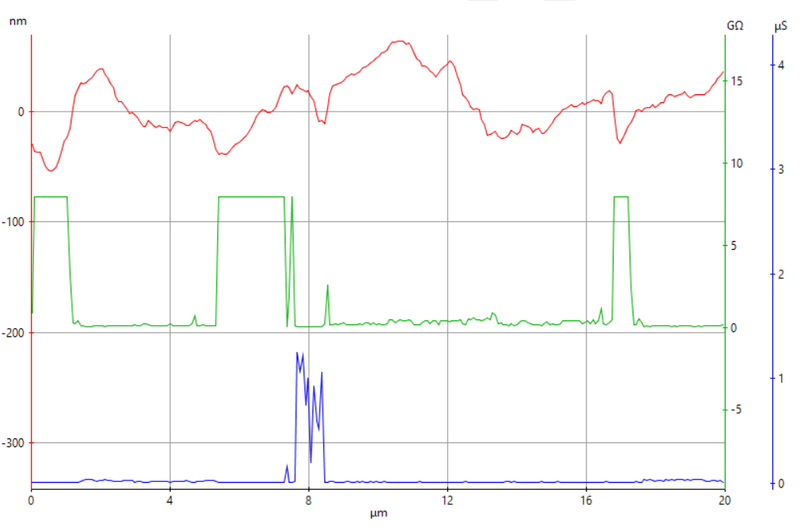 Line profile (above): Topography line profile (red line, y-axis on left) resistance line profile (green, y-axis on right), and conductance line profile (blue line, y-axis on right). An LIB electrode was investigated using a Park NX-Hivac AFM system . The topographical, electrical and mechanical data of the sample were measured under high-vacuum to perform a 20 µm x 12 µm scan with a resolution of 256 x 150 pixels. Conducting this experiment under high-vacuum led to sensitivity and resolution improvements . High-vacuum also led to accuracy and repeatability enhancements while minimizing damage suffered by the tip and/or sample. The force between the tip substantially lower than that conducted in ambient air or N2, as the liquid film present under ambient conditions reduces the quality of the electrical contact . A conductive diamond coated probe (NANOSENSORS™ CDT-NCHR) with a nominal force constant of 80 N/m was used in this experiment. In Pinpoint™ SSRM, the sample’s topography, electrical properties and mechanical properties can be acquired simultaneously. The conductive tip maps the topography by monitoring its feedback signal, approaching the sample until it reaches a predefined force threshold point, measuring Z scanner height and rapidly retracting. The current distribution of the samples is mapped each time the tip engages the sample surface. The current flow, produced by the applied bias voltage between the conductive tip and sample, is measured at each landing point to acquire the electrical data. Generally, the current flow is very small and needs to be augmented by a current amplifier before it can be processed into an image. The Park NX-Hivac is equipped with an internal current amplifier with a variable gain of 106~1012 V/A that is applicable to most measurements. The applied external sample bias used in this experiment was 3V. Additionally, at each point of the image, the force-distance curve is acquired and used to calculate the mechanical properties of the sample being measured. During data acquisition, the XY scanner stops and the contact time is controlled to give enough time for the scanner to acquire precise and accurate data. The qualitative and quantitative results acquired during the experiment are shown in Figures 1 and 2. All images were analyzed using Park XEI image processing software developed by Park Systems; the software generated a corresponding line profile as well as image analysis. The Park XEI software maps the acquired signals into a color table. Figure 1 presents the topography and electrical data measured in the sample. The topography image (top-left) shows that the sample surface consists of circular shaped plateaus with diameters ranging from 2 µm to 8 µm. The circular plateaus with brighter colors represent areas with greater height while the areas with darker color represent low lying areas. 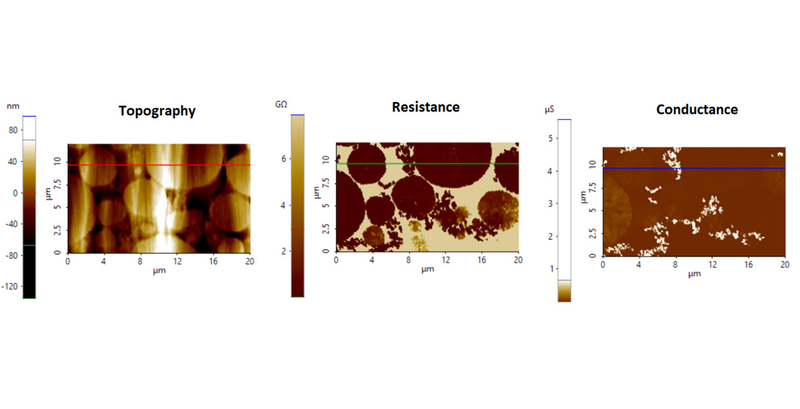 The resistance image (top-right), feature brighter colored areas that represent higher surface resistivity while areas with darker colors represent lower surface resistivity. The darker colors on the conductance image (middle-left) represent areas with lower surface conductivity while brighter colors represent higher conductivity. By comparing the topography and resistance image, one can easily observed that circular plateaus with higher height have lower resistance compared to low laying areas, while comparing the topography and conductance image will show that circular plateaus with higher height have higher conductance compared to low laying areas. This can also be observed in the 3D-overlay image of topography and conductance (bottom) acquired in Park XEI. Both resistance and conductance image also show a clear picture of the small grains surrounding the circular plateaus. It was observed that these small grains have lower resistivity and higher conductivity compared to the circular plateaus. Analysis of the corresponding line profile (bottom-right) of the topography, conductance and resistance images confirms that the circular plateaus are regions with highest height (approximately 50-60 nm). On the other hand, low lying areas possess highest resistivity (approximately 8 GΩ). The line profile of the conductance image shows that the tiny grains around the circular plateaus are regions with the highest conductivity (approximately 1.3 µS). Figure 2 represents the mechanical data measured in the sample. In the stiffness images, the brighter areas represent a surface with higher stiffness and modulus while the darker areas correspond to the surface with lower stiffness and modulus. The adhesion image does not show significant variations between the plateaus. A tendency of higher adhesion is observed between the plateaus. The average adhesion force was measured to be 80 nN. The stiffness image shows noticeable stiffness variations in the sample surface. The measured stiffness value of the circular features represented by the dark color map is approximately –2.8 µV (note that the stiffness unit given here is for qualitative data comparative purposes and does not represent an absolute physical unit value of stiffness), while the areas represented by the bright color map were in a range from –1.5 to –2.0 µV. A lithium ion battery electrode was successfully characterized by the Park NX-Hivac system using PinPoint™ SSRM. The data collected in this experiment demonstrate that this technique is an effective means for measuring the quantitative and qualitative topographical, electrical and mechanical data of advanced materials with improved image quality and data accuracy. Overall, the PinPoint™ technique described in this study will greatly help researchers and device engineers in understanding the electrical and mechanical behavior of certain materials with unique properties such as LIB electrodes. Tarasco M, et al., Issues and challenges facing rechargeable lithium batteries. Nature. 2001 Nov 15;414(6861):359-67. J. Chen, et al., Unveiling the Roles of Binder in the Mechanical Integrity of Electrodes or Lithium-Ion Batteries. Journal of The Electrochemical Society, 160 (9) A1502-A1509 2013). L. Vasconcelos, et al., Grid indentation analysis of mechanical properties of composite electrodes in Li-ion batteries. Extreme Mechanics Letters Volume 9, Part 3, December 2016, Pages 4. G. Kermani, et al., Review: Characterization and Modeling of the Mechanical Properties of Lithium-Ion Batteries. Received: 30 September 2017; Accepted: 24 October 2017; Published: 30 October 2017. A. Mishra, et al., Electrode materials for lithium-ion batteries. Materials Science for Energy Technologies Volume 1, Issue 2, December 2018, Pages 182-187. Received in revised form 16 June 2010 Accepted 17 June 2010.
alloy-based electrode materials for rechargeable Li-ion batteries. 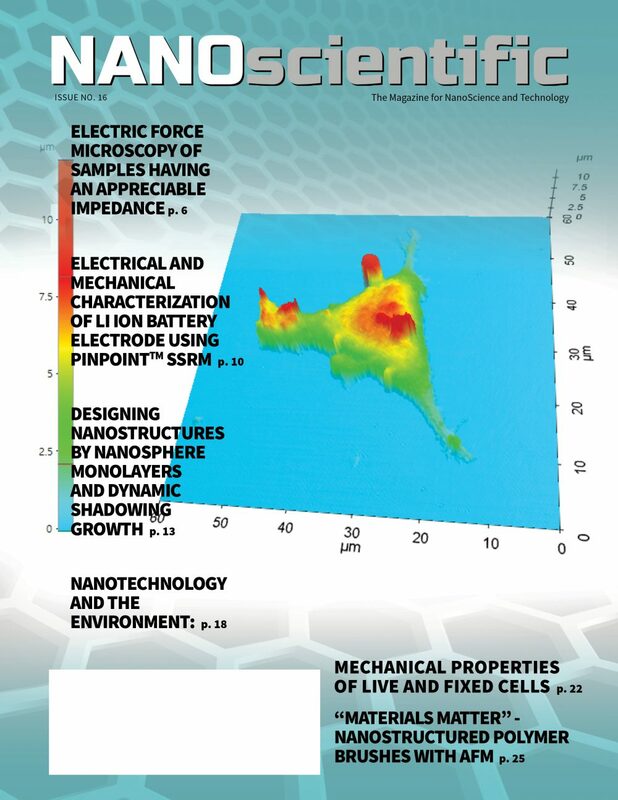 Journal of Mechanical Science and Technology 27 (5) (2013) 1205~1224. Park Systems Introduces Park NX-Hivac, a High Vacuum SSRM AFM System for Optimal Results in Semiconductor Manufacturing Failure Analysis. F. Susai, et al., Horizons for Li-Ion Batteries Relevant to Electro-Mobility: High-Specific-Energy Cathodes and Chemically Active Separators. doi: 10.1002/adma.201801348.